Here are couple of interesting bits of behavior that I've not seen before. 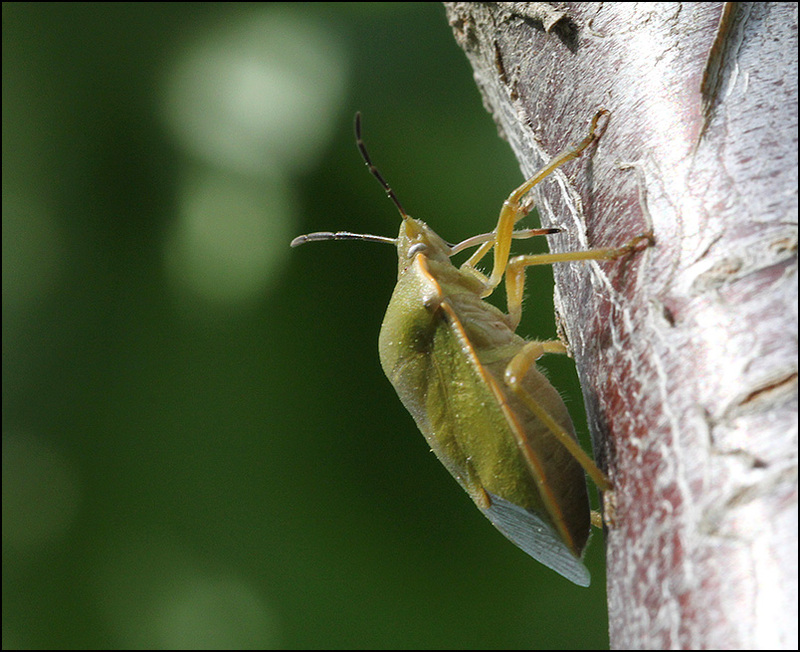 First, we have a green shield bug probing and apparently feeding on the branch of a cherry tree. This particular branch is at least 2 years old, so I'm surprised that it's tender enough to attract the bug's attention. I saw two such bugs, working at different spots on the same two branches for at least 1/2 hour. Here the bug has its flexible feeding tube partly retracted from the rigid rostrum. Here the feeding tube is completely retracted from the rostrum. I've not seen these bugs on this tree before, and this behavior of removing the feeding tube from the rostrum is new to me. If anybody knows more about this, I'd appreciate hearing. Handheld, bracing against the branch, Canon T1i with 100 mm f/2.8L Macro IS USM lens. Natural light, exposure data is in the EXIFs. These are crops of various amounts. I could only get to within about 1 foot of the beast without spooking it. Very interesting. 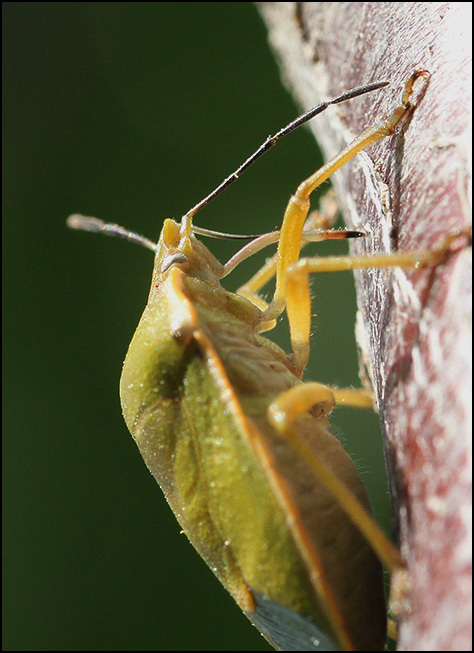 I've been bit by some true bugs, so I know from experience that their rostrums are needle sharp and that their digestive enzymes are wonderfully effective. Many plants have evolved defenses to protect tender leaves and shoots, eg trichomes which secrete nasty compounds and toxins of various kinds. 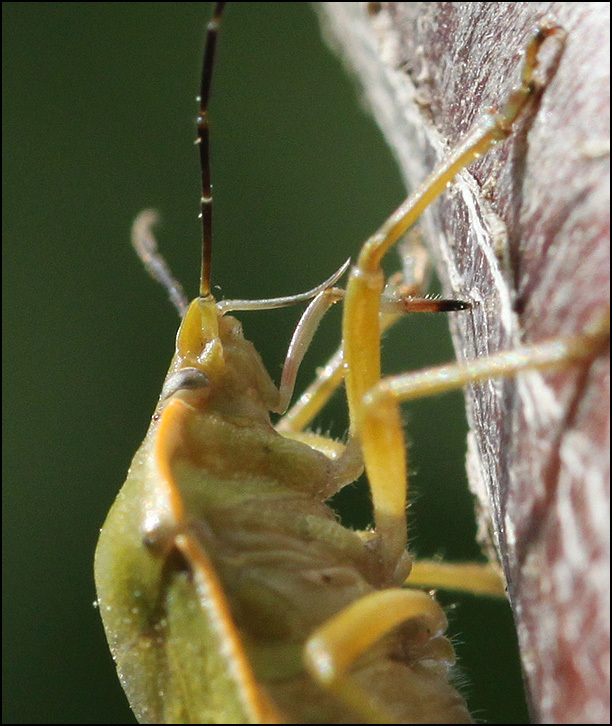 So if a shield bug can manage to get its rostrum through the outer bark, it could be worth the effort. It will avoid many of the potentially hazardous defenses protecting easier targets. As to the removal of the feeding tube, I know that this is possible... but as to why it occurs, I am not entirely sure. It might have something to do with pressure... if the bug can't generate enough negative pressure (by "sucking") to encourage sap to flow, it might be better off to remove its feeding tube to allow sap to flow based on the pressure differential between the phloem tissues and the air. Who would have thought? Learned a good bit from all this, that I didn't know. Good stuff there Rik and Rylee, thanks. I got a more official explanation for you. According to "Insects: Their Natural History and Diversity" by Stephen A. Marshall, hemipterans make a habit of removing the stylets (the feeding tube) from the labial sheath when initially cutting into something. It doesn't really say why, but it apparently the mandibles and maxillae (which make up the labial sheath) slide against one another to do the cutting/piercing. I'm guessing that may damage the stylets if they are not removed. Or the sylets may just interfere with the process. Excellent -- thanks very much for that information!